In Zimbabwe, 600,000 children are orphaned each year as a result of the AIDS epidemic. The Zienzele Foundation engages in global fundraising efforts to provide these children with basic needs, education and healthcare. Mary Anne Flournoy, a Rural Action board member, is working with Prisca Nemapare, Visiting Professor of African Studies at Ohio University and founder of the Zienzele Foundation, to raise money for the children. 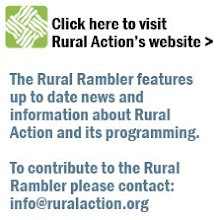 If you are interested in contributing to the effort, please e-mail Robin at robin@ruralaction.org, and your e-mail will be forwarded to Mary Anne Flournoy. All contributions to Zienzele are tax deductible. To learn more about the Zienzele Foundation, please visit www.zienzele.org.